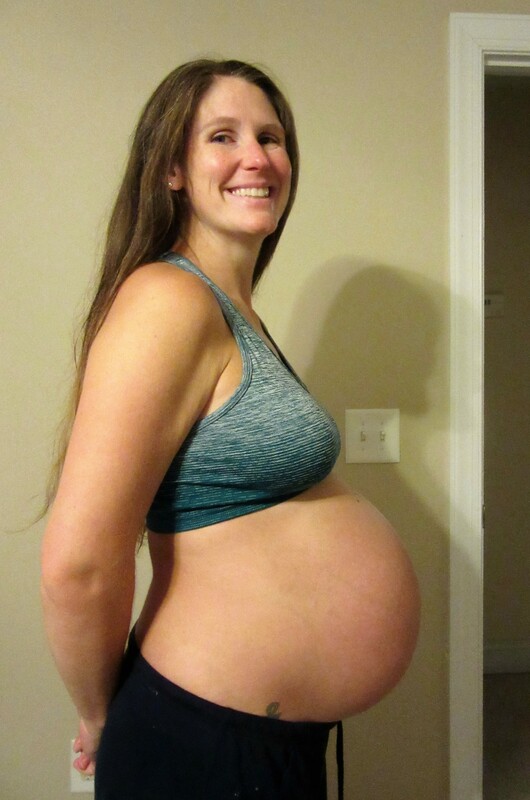 Pregnancy #3 Update – Hello Due Date! I’ve officially made it to 40 weeks. Officially reached the point where strangers start to look a little nervous when I come near them, as if I may pop like a puff ball at any moment. Officially reached the point where my dad, God love him, asks every single time we talk, “Any rumblings down there?” Officially reached the point where I am more tired of being pregnant than I am terrified of adding another child to the mix. I had my 40 week appointment yesterday, which included a non-stress test (NST) to check and make sure that Wally is still thriving in there. It took forever to get enough movements (with accompanying heart rate changes) tracked for them to be happy – we ended up having to bribe Wally with a Diet Coke and some snacks just to get him/her to move about a bit. But as I pointed out, I’m typically on my feet at work at 10:30 am and Wally is fast asleep, rocked gently by my walking. If they wanted lots of movements, we should have scheduled the NST for 8:30 pm when I finally sit down for the day and Wally has a dance party. Once we finally passed the NST, the doc checked me out, pronounced me 2 cm dilated, and offered to do a membrane sweep. Call me crazy, but I declined. With the Littlest Brewster, we had our OB do a membrane sweep at my 40 week appointment and my water broke with a slow leak 3 days later. BUT labor with her was a loooooooooong (27 hour) process, in part because I don’t think my body was actually ready to go into labor, my water just happened to break which put me on the clock to deliver. So I’m a little leery of having it done again, even if the doc thinks its a good idea. I’ll just wait and either go into labor on my own or have this baby evicted like we did with BIT. Otherwise, at this point, I’m doing pretty well. Weight gain as of this morning was 21.8 lbs, so right on track with my last two pregnancies. I’ve still got heartburn at night and I’m still not sleeping for more than 90 minutes or so at a time, but nothing too terrible, symptom-wise. I did finally decide to go ahead and start maternity leave from work as of today. Monday afternoon I was exhausted and actually having some contractions and the thought of going into labor already tired from working all day was enough to scare me into calling it. I feel like a wuss and a slacker and like I’m letting all of my coworkers down by not working through the end of this week like I had planned, but that’s all in my head, not in real life. They have been nothing but supportive and kind and excited for us to finally have this baby. So now it’s a waiting game. The doc yesterday said she didn’t think I’d make it to my induction date; I tried not to scoff because I’m pretty sure I will. But I’m okay with that. Because one way or another, by this time next week Wally will be here! This entry was posted in Babies, Home Life and tagged BrewsterMama, Pregnancy Update, Wally by BrewsterMama. Bookmark the permalink. You look fantastic! Seriously, by the end of my pregnancies I looked like an exhausted wreck. Can’t wait to meet Wally!